Echoing the meter of “Mary Had a Little Lamb,” Ward uses catchy original rhymes to describe the variety of nests birds create. 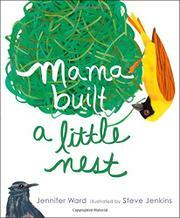 Each sweet stanza is complemented by a factual, engaging description of the nesting habits of each bird. Some of the notes are intriguing, such as the fact that the hummingbird uses flexible spider web to construct its cup-shaped nest so the nest will stretch as the chicks grow. An especially endearing nesting behavior is that of the emperor penguin, who, with unbelievable patience, incubates the egg between his tummy and his feet for up to 60 days. The author clearly feels a mission to impart her extensive knowledge of birds and bird behavior to the very young, and she’s found an appealing and attractive way to accomplish this. The simple rhymes on the left page of each spread, written from the young bird’s perspective, will appeal to younger children, and the notes on the right-hand page of each spread provide more complex factual information that will help parents answer further questions and satisfy the curiosity of older children. Jenkins’ accomplished collage illustrations of common bird species—woodpecker, hummingbird, cowbird, emperor penguin, eagle, owl, wren—as well as exotics, such as flamingoes and hornbills, are characteristically naturalistic and accurate in detail.